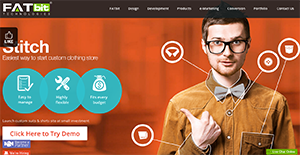 Stitch is a website builder designed specifically to create online custom tailoring e-commerce platforms, and enabling merchants in the customized shirts and suits industry to market and sell their services online. Stitch came to be when marketing experts at FATbit recognized the potential of this marketplace. The system has proven to be a very effective turnkey solution for custom tailoring portals. Stitch is integrated with user-centered applications, and comes with a very intuitive design that is built on the basis of simplicity. Websites created using Stitch are so easy to navigate that using them doesn’t require going through a steep learning curve. As a clone script, Stitch offers fashion merchants with a very cost effective e-commerce solution, and it is highly recommended for expanding businesses and startups. The builder adhered to the highest quality standards adhered to by established clothing websites such as Modern Tailor and Blacklapel. Stitch provides clothing and tailoring merchants with a popular web-based custom tailoring platform that easily addresses to their business needs in this very modern age. The system is built to cater the needs of tailors with brick and mortar stores, and can be leveraged by entrepreneurs who are intent on starting an online custom tailoring venture. The platform functions as the ideal option medium for tailoring stores that are on the verge of expanding their business by taking their enterprise online. It’s really easy to start your custom clothes store with Stitch. With Stitch, users will greatly love how the system streamlines the whole process. Customers simply go the site and can dictate how they want their suits and shirts done. With guidelines in every step of the way, customers will find it easy to customize and personalize different parts of clothing, such as design of pockets, lining, lapels, and more. A large demographic of people who browse the internet do so using their smartphones or tablets. This is the main reason why Stitch is built to be mobile-ready. The system provides businesses with a custom tailoring portal that can quickly adapt and adjust based on the screen size of the visitor’s device without disrupting user experience. Each and every module of the Stitch platform is created by programmers who can boast with extensive programming experience and expertise. That means the system is easy to maintain, not to mention using the latest open source technologies. Users will also find useful the blogging feature that comes with the Stitch. With it, they can keep the visitors updated with the latest news related to the store. Other useful features include coupon management tools that help the store owner attract potential clients to the store. What Problems Will Stitch Solve? Technical glitches are one of the major reasons why businesses have to delay their plans, which affect their growth. Due to this reason, Stitch comes with one year free after sales support. Stitch enables the visitor to see how the end product will look like before placing an order. With so many customization options, displaying the final product in high resolution image brings down the system’s performance. Stitch answers this question with the help of customizing tools, which not only make the entire platform lighter, but also make it blazing fast. Stitch is developed on a custom framework using the latest open source technologies. Due to custom nature of Stitch, it provides more security and offers an economical way to extend the platform. If you are considering Stitch it might also be beneficial to examine other subcategories of Best eCommerce Software listed in our base of SaaS software reviews. There are well-liked and widely used applications in each software category. But are they necessarily the best fit for your organization’s special requirements? A market-leading software application may have thousands of subscribers, but does it offer what you need? For this reason, do not blindly spend on popular systems. Read at least a few Stitch reviews and mull over the aspects that you want in the software such as the price, main tools, available integrations etc. Then, shortlist a few systems that fit your requirements. Check out the free trials of these apps, read online comments, get information from the maker, and do your homework meticulously. This exhaustive groundwork is certain to aid you find the best software application for your organization’s special wants. We realize that when you make a decision to buy Shopping Cart Software it’s important not only to see how experts evaluate it in their reviews, but also to find out if the real people and companies that buy it are actually satisfied with the product. That’s why we’ve created our behavior-based Customer Satisfaction Algorithm™ that gathers customer reviews, comments and Stitch reviews across a wide range of social media sites. The data is then presented in an easy to digest form showing how many people had positive and negative experience with Stitch. With that information at hand you should be equipped to make an informed buying decision that you won’t regret. What are Stitch pricing details? What integrations are available for Stitch? If you need more information about Stitch or you simply have a question let us know what you need and we’ll forward your request directly to the vendor.